In January 1978, when I was 28 years old, I arrived in New York City from San Diego for a five-month stay. Without a studio in which to make art, I decided to write about it. Though I had no training as a critic, I had made and thought about sculpture for a decade. Robert Smithson wrote to make way for his sculpture in the late ’60s, I knew, as had Donald Judd before him. While doing my MFA at the University of California, San Diego, between 1972 and 1974, I’d been one of Manny Farber’s many teaching assistants. Farber painted, but was better known for film criticism. He understood movies visually rather than narratively, and recognized the radical force of R. W. Fassbinder’s and Werner Herzog’s filmmaking on first sight. The poet David Antin had been my thesis advisor, and he was talking and writing about contemporary art. My MFA classmates Martha Rosler and Allan Sekula had published criticism soon after graduating, and each had received an NEA critic’s grant. Their example pushed me along. I wrote two reviews of 500 words and three short features and sent them to Art in America, Artforum, Art News and Arts Magazine. 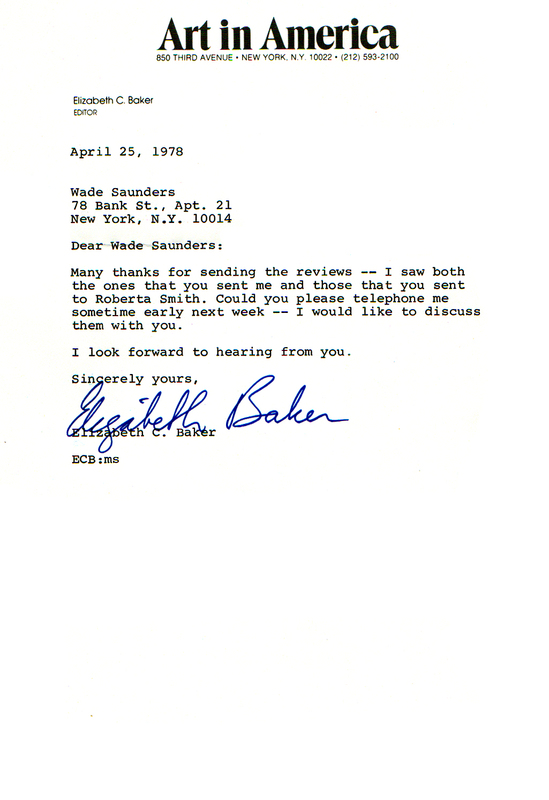 I received a note from Elizabeth C. Baker, the editor of Art in America, requesting that I call. I felt intimidated when we met, but she put me at ease by asking if there were artists whose shows I would like to review. I mentioned Willard Boepple, Joel Perlman, Bruce Robbins and Italo Scanga; Baker encouraged me to write about their exhibitions. I submitted copy before returning to California for the summer. She ran one of the unsolicited pieces I’d mailed in—on Lyman Kipp—in the July/August 1978 issue. The reviews we had agreed on ran in the September/October issue. I began teaching in Philadelphia in September 1978. The following January, Baker surprised me by asking me to cover the upcoming Whitney Biennial. I accepted her unlikely offer with trepidation, because I didn’t know if I could write capably about painting. Influenced by Leon Golub’s sociological analysis of the Whitney’s painting Annuals 1950-1972 [Artforum, March 1973], I described the ’79 Biennial as a sort of trade fair for powerful Manhattan galleries. The feature came out in the March/April issue. I focused on artists for whom my words could make a difference, writing at greatest length on Martin Puryear, who wasn’t well known. I realized that criticism was advocacy, and, temperamentally, I preferred writing on artists who hadn’t been much covered. Completing the short article gave me confidence. Later the same year I proposed a long feature about bronze casting. As an artist I recognized—before critics did—that bronze was returning as a sculptural medium of choice after 50 years of disfavor. I wrote a detailed overview of casting and then treated the 11 artists individually, writing 250 to 500 words on each, a length I’d mastered doing my first reviews. The article ran in the Summer 1980 issue. I used a similar approach for an extended December 1982 piece I initiated about 10 sculptors, well known in the ’50s, who had faded from view in the following decades. I went to meet Reuben Nakian, Phillip Pavia and the remarkable Raoul Hague, among others. (Nine of these sculptors were included in Lisa Phillips’s exhibition “The Third Dimension” which opened two years later at the Whitney Museum.) Baker helped me believe that these time-consuming projects mattered. Writing articles, I realized, gave me access to established artists, offered a continuing education in sculpture and provided visibility. In 1983 she asked me to write a feature on Mark di Suvero. In treating a single artist in depth, I nuanced my approach, discussing both works I admired and works which dissatisfied me. When the story ran that December readers saw a di Suvero sculpture on the cover. In early 1985 Baker accepted my proposal for a collection of interviews with my sculptor peers; I wrote an introduction setting forth the ways our work was linked, and edited the ten tape-recorded conversations into monologues, which each artist revised and approved. While articles rarely ran ten pages, Baker spread the interviews and accompanying color pictures over 28 pages in the November 1985 issue and put Judy Pfaff’s work on the cover. I would return to this interview format twice, including roughly 20 artists each time. From the first Baker paired me with the editor and novelist Ted Mooney. We worked together for 30 years. Both of us admired Judd’s startling ability to describe works and appreciated how his seeing supported his interpretation. Mooney had the gift of preserving my “voice” and meaning, while easing the abruptness of my prose. Baker oversaw everything; then everyone in editorial got a chance to add comments and corrections to galleys. It was Mooney’s job to balance these pushes and pulls, while preserving the work he’d already done. I looked forward to his editing. Many of his changes were so subtle that I didn’t notice them. If I felt strongly about a phrasing we would work it through. I met the French sculptor Anne Rochette in New York in February 1986, and soon I proposed that we write together. She had written a little art criticism in France in the early ‘80s, and we shared a passion for looking closely at sculpture. Baker and Mooney accepted this uncommon arrangement, insisting only that during the back-and-forth of editing they would engage with but one of us. Since 1986, Anne and I have co-written almost everything we’ve published; we married in 1987. The choice of subject for almost all our articles has come from us. We rarely accepted assignments. We preferred writing features, since they allow a degree of analysis impossible in reviews, and readers remember them better. Baker let us tackle ever more complicated subjects, even though we’d moved to Paris in 1990 and could not write often, since we were juggling our studio practices and teaching jobs while rearing two daughters. When we took months, or longer, to pull together an article, her patience never flagged. Anne and I understood that editors often saw word counts as sacrosanct, so we continually condensed our drafts. In practice, Baker never cut the texts we’d written, and Mooney never altered our meanings. Every review and article we submitted got into print; we always were paid. For long or laborious pieces we received more than scale. Baker and Mooney did shorten and rearrange the interviews we submitted; they weren’t our words and we always found it hard to adequately condense what others had said. With all interviews we ran the final versions by the artists concerned. Sometimes articles would not appear as quickly as we hoped; we came to realize that Baker held the galleys until she had space in an upcoming issue. We remain grateful for the ways Mooney, Baker and the magazine’s editors improved our work. I rewrite obsessively, a habit aggravated when computers replaced typewriters. More than once I submitted copy, then kept revising and resubmitting it. Mooney had to carry his edits from version to version. He wasn’t vengeful when another editor might have been. Art in America was Betsy Baker’s magazine as The New Yorker had been Harold Ross’s, and then William Shawn’s. Anne and I were privileged to write for her. We stretched to meet her standards, which ever remained just beyond our reach. We were treated wonderfully, and we always knew it. Anne has more inclusive taste than I do, so we’ve covered artists I wouldn’t have written about alone; my single-mindedness has meant that we’ve hewn closely to sculpture. We avoided writing on artists we knew personally, though we sometimes became friends with people we covered. I wrote one well-paid catalogue essay in 1987 for an exhibition of cast sculpture at Moore College of Art in Philadelphia. I thought it would be easy, since I was reprising material I’d covered in my 1980 article on bronze casting, but discovered that this format came along with constraints: the expectation that I would write more favorably than objectively. I’ve stuck to criticism since. Typically, Anne and I divided up the works we wanted to discuss and wrote individually. Then she revised my paragraphs, and I hers. I would struggle ceaselessly with the ledes and the conclusions, while Anne dealt with ideas and textual flow; she has the better feel for vocabulary, despite English being her second language. Writing jointly we spent more total hours than we would have writing alone. By the end of an edit we averaged a scant 25 words per hour. As I got older, I found it harder to write about my peers, so three times I took on subjects that sprang from personal experience, and for which I felt uniquely suited. I wrote solo in these pieces because I needed to write in the first person singular. I’d worked as a studio assistant in ’71-’72; twenty years later I examined the subject of assistantship in a 26-page-long suite of interviews. Baker organized the January 1993 issue around my article, pairing it with a historical study of the complexities of attributing Rembrandt’s paintings given his many assistants. In March 2000 I published an important article on the disappearance of Bill Bollinger’s oeuvre; it was the longest and most difficult text I ever wrote, and became the basis for a traveling survey of his work a decade later. And in February 2004 I explored the complicated issues surrounding the posthumous works produced by Bas Jan Ader’s estate. The magazine carefully vetted my research, which passed unchallenged when published and helped protect Ader’s sparse but crucial output. In 2006 Anne and I undertook a series of interviews with 19 sculptors from Los Angeles. The article ran, at over 27,000 words, in November’s issue. Baker’s support determined whether a story of this length would be published. She risked more than we did. Her word was her word. Over a quarter of the artists we’ve written about have died; almost all the others are still working and showing. For a number of them, our articles were their first appearance in the features section, rather than the reviews section, of an art magazine. Some of the people whom we covered at the beginnings of their careers are well known now. When I started in 1978 I did not imagine that my writing could become the part of art discourse that it has. Print publications have been under enormous financial pressure since 2008. Mooney and Baker both left Art in America that year. I had hoped we could work together two score years, but it wasn’t to be. Anne and I decided to create this website since very little of what we had published—around 100,000 words of criticism and 57,000 words of interviews—was available on the Internet. Art in America’s digital archive only goes back to 2010, so almost everything within this site is based on our scans of around 300 printed magazines pages, whose glossy paper and inks have aged over the decades. Benoit Pieron cleaned up the pdfs, extracted the texts, converted them into a .doc format using optical character recognition software and constructed the site. I proofread the texts. Over the preceding decades the writer, and now blogger, Dan Nussbaum edited some of the texts before we submitted them, and several times the sculptor Joel Fisher re-ordered tangled sequences of paragraphs. Nancy Princenthal edited the Simon Starling article, which ran in February 2010, and Faye Hirsch the second feature on Bill Bollinger, which appeared in the June/July 2011 issue. After leaving the magazine, Baker still made herself available to give our pieces a read-through. Elle est sans pareil. Suggestions and inquiries are welcomed.